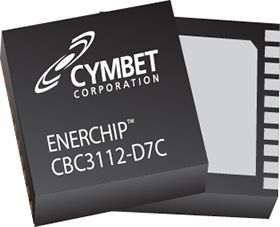 The EnerChip CC is the world’s first Intelligent Thin Film Energy Storage Device. It is an integrated solution that provides backup energy storage and power management for systems requiring power bridging and/or secondary power. A single EnerChip CC can charge up to 10 additional EnerChips connected in parallel. During normal operation, the EnerChip CC charges itself with a controlled voltage using an internal charge pump that operates from 2.5V to 5.5V. An ENABLE pin allows for activation and deactivation of the charge pump using an external control line in order to minimize current consumption and take advantage of the fast recharge time of the EnerChip. When the primary power supply dips below a userdefined threshold voltage, the EnerChip CC will signal this event and route the EnerChip voltage to VOUT. The EnerChip CC also has energy storage protection circuitry to enable thousands of recharge cycles. The CBC3112 is a 20-pin, 7 mm x 7 mm Dual Flat Nolead (DFN) package, available in tubes, trays, or tapeand-reel for use with automatic insertion equipment. Business and industrial systems such as: network routers, point-of-sale terminals, single-board computers, test equipment, multi-function printers, industrial controllers, and utility meters.